How does Computer Network Work for Kids? Whether if you are from computer science background or not, we do use the internet and we know it better to use it. The Internet is nothing but the network of computers. When your browser through any website, as like you open this article, you send the request to another remote computer where this webpage is saved. Remote computer sends you this page to your local system where you can read and browse through the web page. Are you curious- how does computer network work? At the end of this article, you can visualize computer networking. All the systems in the computer networks are linked together to share hardware as well as software resources. If someone asks, what is the computer network, it is sufficient. But how does Computer Network Work, is really interesting. An understanding computer network is simple as any non-technical guy understand it, and also it is too complex as it will be difficult even for technical expert understanding every detail of it. I am considering you a novice computer network geek. I am trying my best to elaborate this topic, so that, it will be easily understood – How computer network works even for a non-technical person. How does Computer Network Work for Kids to understand? Just giving you a simple example of the Home Drainage System. Some analogy I can make from by comparing Home Drainage System with an actual computer network. All the pipes and plumbing you find in your home. It is same as cable wires you find in the computer network. Drainage system uses pipes to make the water flow and computer network uses the cable to transfer your data from source system to destination system. The drainage system in our society is interconnection among multiple home drainage system, we call it as LAN (Local Area Network) in computer networking. There is the complete drainage system in our city, likewise, there is WAN (Wide Area Network) through which all systems are interconnected over the internet. It is really so simple, isn’t it? A computer network can be related to Sending Gift Parcel to Your Friend. Bluedart verifies the parcel, weight it, pack it and then apply the appropriate sticker. This sticker describes everything about the parcel. Bluedart then ships and delivers it to other station. The parcel you are sending to your friend is same as data packet over the network. It goes through all the phases before it delivers to the destination. Every router verifies the data packet and add own header (like a sticker on the parcel) and forward it to next router. How does Computer Network Work Technically? But how does actually packet sent by source reaches to the destination? What actual process carried out on data packet at every router? How does every router choose next router even though there are multiple routers are connected to it? Is it easy to answer all these questions? Definitely not, especially for a non-technical person! There are many more complex things happen over single packet (4B) before actually data packet reaches the destination. Everyone knows Computer network is sending the packet and getting it delivered it to the destination. But the expert knows every complex thing that happens in between source and destination. That complex thing includes client, IP and MAC address, HTTP, DHCP, DNS, server… and the list goes up. If I correlate… These are all the computer network protocol that governs communication over the computer network. Here the client is a system of the person who receives and deliver the parcel. HTTP is actually packed parcel. DHCP assigns the address to every client before sending the parcel. The server is courier service which monitors every client and works on their parcel. Communication happens between client and server called as source and destination. Addresses are used to identify and locate the source and destination. These are some computer networking terms and I did my best to correlate it with postal parcel system and home water drainage system so that you can understand it easily and very well. 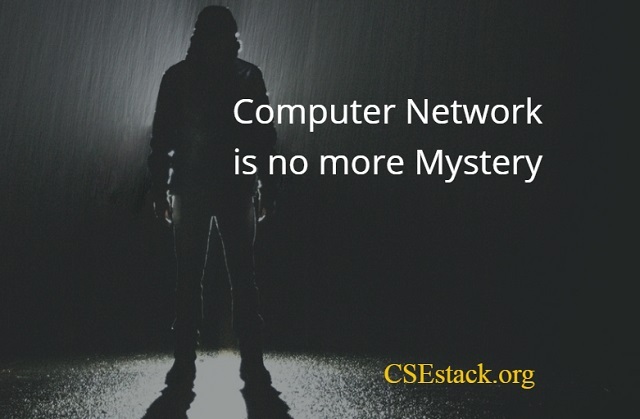 We will see all the technical details about each computer networking term in upcoming articles on CSEStack.org. Watch the following video. It gives you a visual impression How Computer Network Works actually… I do watch it. It’s so awesome to give me the real sense of the internet. You may have multiple questions as we have not discussed computer network from the technical perspective. Computer network from the technical perspective, I will cover in upcoming articles. Though if you have any questions, use comment section below. I would like to discuss it over here. How does Comp Network Work?